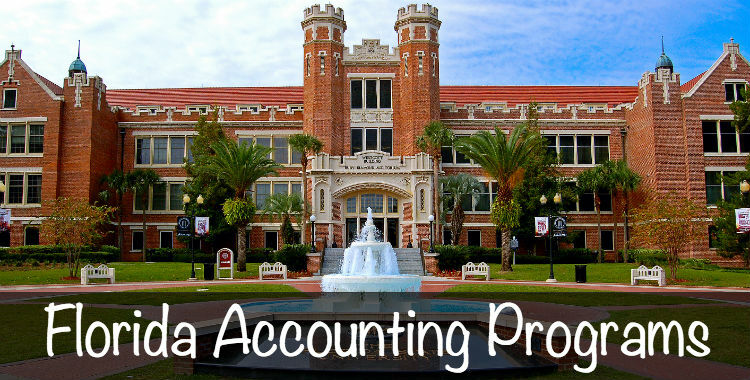 Accounting is a sought after field for many people and Florida is certainly no exception. In the state of Florida, there are over twenty programs to choose from. All areas of the state are covered if you want to study accounting there. As with any important life decision, you would not take your choice of school lightly. It’s so important to research schools before choosing one. The university nearest your house may be the most convenient, but it may not necessarily be the right fit for you. Firstly, you should check out the school’s website and find out what kind of programs they offer. They will likely list the number of credits their courses are and whether or not they offer prep for the CPA exam. Find out who their faculty is comprised of and if they are any good. There are websites that give ratings of professors and the programs. Also, you may want to actually visit the school and talk to someone on staff. If you’re lucky, you may be put in touch with an alumnus who went through the program. They can tell you exactly what the experience at that school is like. It’s not enough to look over a brochure and decide right then and there that you are going to apply there. Look over as many options as you can until you find exactly what you’re looking for. If you are hoping to one day become a certified public accountant, you have a very long but rewarding road ahead of you. Most states have very strict rules and standards for licensing accountants, so your first step is getting the educational requirements. Most states now require that you have at least a 150 credit undergraduate degree. That degree must have a certain number of accounting courses as well as business courses. Once you have completed your bachelor’s degree, you will have to qualify for the CPA exam. This exam is extremely difficult, so make sure that you have covered every complex financial concept in your studies. It has a low pass rate, so only the very best students get through to the next requirement: an ethics exam. After these exams are successfully completed, you will require a certain number of hours of experience under your belt. Every state has its own requirements. In order to qualify for your CPA license in Florida, you must have completed 150 semester hours or 200 quarter hours. Be sure to research exactly what courses are required and find out if your desired program covers those requirements. The state of Florida requires that in addition to completing the CPA exam, you must also have at least one year of work experience, verified by a licensed CPA. Most people are eager to learn their earning potential before choosing their career path. In Florida, on average a licensed certified public accountant makes around $75,000 per year. Also, take into account the number of years of experience, the schooling, and the rigorous testing needed to even get licensure. You likely will not make that much to begin with, however if you join a strong team or start your own business, you can certainly earn that much or more. University of Florida scores highest of all the accounting programs offered in Florida. Its program is within the Fisher School of Accounting, which is a part of the Warrington College of Business Administration. This program is quite well known and consistently scores rather high overall in accounting programs across the country. With bachelors, masters, Ph.D. level programs, this school offers all levels to a student seeking their eventual CPA licence. Students are advised that if they are seeking their CPA, they will need to enter the 3/2 program which is an integrated, five year 150-hour program in which you will earn your BSAc as well as your MAcc. This program ensures that you will fulfill the requirements for taking the CPA exam. University of Florida seems to be the best choice for accounting schools in Florida, in terms of the program they offer, as well as the impressive faculty. Be sure to speak with someone on staff about what exactly you will need in order to apply for a spot. Best of luck on your journey and may you pass that CPA exam with flying colors! In the 32nd Annual Professors Survey of 2013, University of Florida ranked number nine (down from number eight in 2012) in the top twenty five undergraduate program. It also ranked number thirteen (down from number ten in 2012) in the top twenty five masters program. It ranked number nineteen (down from number 18 in 2012) in the top twenty five doctoral programs in the US. Florida State University placed on the runners up list for the undergraduate program, and the masters program. Out of the twenty five undergraduate schools with 22+ full time accounting faculty, University of Florida ranked seven. Of the twenty five undergraduate programs with fifteen or fewer full time accounting faculty, it was a tie between University of South Florida and University of North Florida for 22nd place. Overall, it appears that University of Florida has the highest scoring in Florida, however the survey shows a slight dip in the rating. The Warrington College of Business Administration within University of Florida is ranked number twenty in Accounting Degree Review’s 30 Best Accounting Schools for Undergraduates list.